My sweet (and ultra-energetic) friend Amy, from During Quiet Time, motivated this vibrant little kusudama. After she made this beauty here, she felt my life would be incomplete without an origami project of my own, so she challenged me to make one as well, out of junkmail no less! Thanks for that Amy. 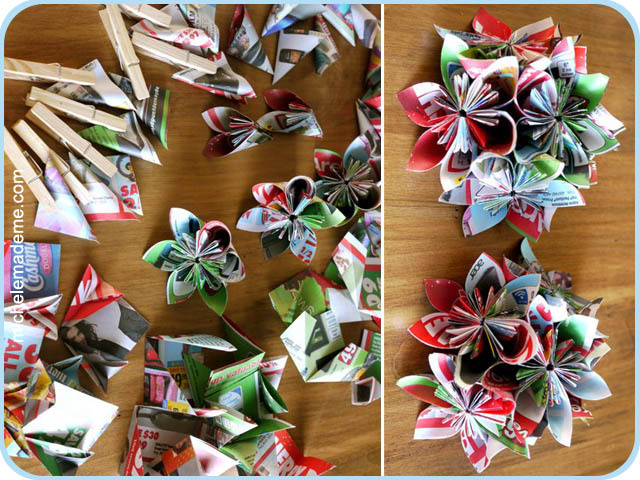 So, to be exact, that’s seventy-two squares of paper, cut, folded over and over, glued once, twice, and thrice to make twelve six-petalled flowers, which in turn, are cobbled together into the resulting kusudama. Phewf!! !… Can’t believe I finished the thing. If you’re looking for an exercise to strengthen your will and build up your fortitude, this will do it Grasshopper. Thanks for the challenge Amy (and yes, it was definitely a challenge)! This post is your Christmas gift. Merry Christmas from me to you! WOW!!! amazing. great challenge and great finished project. Merry Christmas to you both! That’s so beautiful Michele! Love the colours of the junkmail! 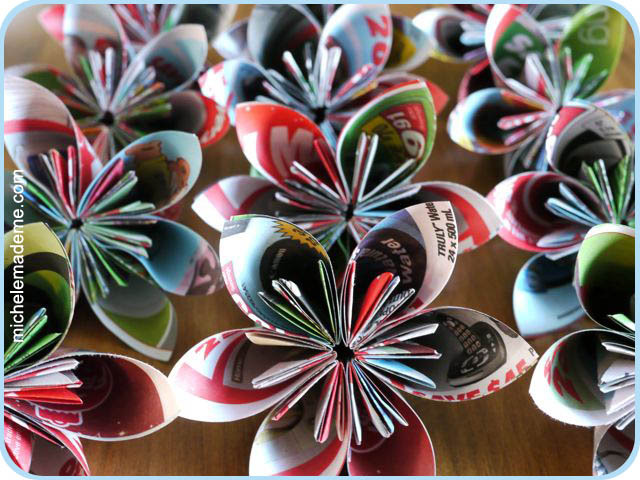 I made 7 flowers, so 5 more to go, you really need some willpower to finish it! I’m not sure yet, how to glue them together into a ball. Oh, it is a wonderful Christmas gift!!! Your flower ball is lovely. The junk mail is beautiful just as I thought it would be. Thanks for playing along with me pal 🙂 Aren't you glad you made it now that you have? They are so pretty! My goodness, your perseverance paid off. It came out beautifully. Glorious in recycled trash! Um, just reading about it made me tired; lady, you are a far, far better man than I. But now you have it to display for years and years and years! love these, I made quite a few this year to. It has become an obsession. MIchelle, any ideas of what to do with bottle caps, some like those of your juice ornament (which I purchased but have not yet made)and some like those that com on plastic milk containers? I have at least a few thousand of them and need some ideas! help! wow! that is serious! beautiful! Oh that is just beautiful! 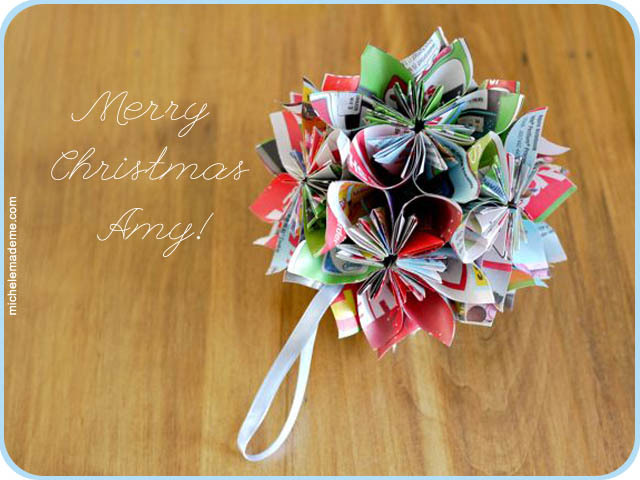 Great use for all the Christmas junk mail we all get! Wow! they r so colorful and pretty . Oh this looks like something right up my alley but best I make sure I have nothing else to do. Beautiful Michelle! p.s I saw your other blog,just fun..so many wreaths..waoo.. So beautiful. Thanks for sharing! Merry Christmas! Joyeux Noël à toi Michele !!!! !